Welcome to the Next Gen in gaming controllers, here will have a selection of Custom Xbox One and modded Xbox One Official Controllers Here you will be able to create your own XBOX ONE Controller from scratch and choose how every single part of the controller looks. Even better is you will be able to get 10% off your controller aswell. Order your custom Xbox One controller now in time for Christmas. More custom options will be available in the next few weeks. To see a full range of controllers click on the banner above and create your own Xbox One controller the way you want it. The next Gen in gaming controllers, experience the action like you have never before, the Official Xbox One Wireless Controller, with new Impulse Triggers delivering vibration feedback to your fingertips, you now can feel every jolt, hit and crash in high definition. Redesigned thumbsticks and an all new D-pad provide greater precision. And the entire controller fits more comfortably in your hands. With over 40 innovations, it’s simply the best controller Xbox has ever made. Are you a gamer that is going to be happy with just a standard Xbox One controller? 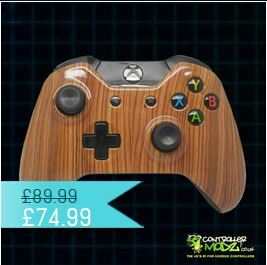 I didn't think so, then you might want to think about getting hold of either a custom or modded Xbox One controller. With a modded controller you can have it built with rapid fire which can turn your single shotgun into a fully automatic killing machine. 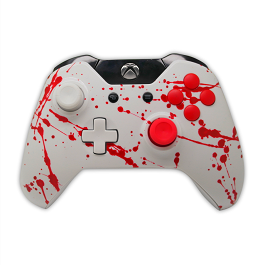 Custom Xbox One controllers come in a huge range of different styles to choose from, there is a whole bunch of hydro-dipped and pattern options you can have. Choose the controller your way, the controllers are fully customizable from the shell, the buttons and the triggers, you choose how you want it. There’s no doubt that the new Xbox One controller is much better than the old Xbox 360 controller, but that’s not to say that people don’t want to be able to make theirs that little bit more special. If you’re not too sure how to go about this then why not check out some modded Xbox One controllers? We’ve got many different ones on our site that you can buy at extremely competitive prices. Fast Reload – As the name suggests, this mod allows you to reload your weapon much faster than before. This can give you a huge advantage over your opponents in games such as Modern Warfare 2 or Ghosts, especially if you regularly play online. Auto Sprint – This particular mod lets you automatically sprint straight after you stop looking at your scope. Most people that use this mod are keen snipers in both COD and BF games since it can help you out a lot at times. Sniper Breath – One problem that a lot of people seem to have when sniping is trying to hold your characters breathe while you’re looking down your scope. With this mod, you’ll automatically hold your breath when you’re looking down the scope with a sniper rifle which means you’ll only have to press one button rather than two! Auto Spot – Do you play BF games a lot? If you do then why not think about using the auto spot mod! This mod helps both you and your team out since you’ll automatically spot the enemy that’s in front of you which is much easier than the way that you’re probably used to using. Drop Shot – As you can probably guess, with this mod you’ll easily be able to get into a prone position which means you’ll be able to avoid your opponent’s shoots towards you. Now you’ll be able to focus on killing your enemy rather than trying to avoid their fire! As you can see from the list above, there are plenty of Xbox One modded controllers to choose from so make sure that you spend some time researching which one is the best for your own particular gaming style. If you’re not a sniper for example then there’s not much use getting the Sniper Breath modded controller. It’s also a good idea to be 100% sure that the mods work on the games that you want to use them on too since some only work on particular games. Overall, buying a modded Xbox One controller is definitely worth the money if you’re passionate about gaming.